As with other volatile agents desflurane depresses the respiratory system. Desflurane respiratory effects are quite different. There is a dose-dependent decrease in tidal volume, decreased minute volume and CO2 retention, and an increase in respiratory rate. The ventilatory response to CO2 is reduced. One of the desflurane respiratory effects is that, the desflurane is extremely irritant to the airway and hence not suitable for inhalational induction. A concentration above 6% causes coughing, breath holding and laryngospasm. However, it causes a dose-dependent bronchodilatation and does not increase bronchospasm in asthmatics. Comparison of the effect of different volatile anesthetics at equivalent concentrations on total pulmonary resistance. At 1 minimum alveolar concentration (MAC), only desflurane significantly increased pulmonary resistance when compared with isoflurane and sevoflurane. At 1.5 and 2 MAC, sevoflurane significantly increased total pulmonary resistance when compared with isoflurane, whereas desflurane caused a more pronounced increase than the other two agents did. Increased pulmonary resistance in comparison to sevoflurane and isoflurane; increased pulmonary resistance in comparison to isoflurane. 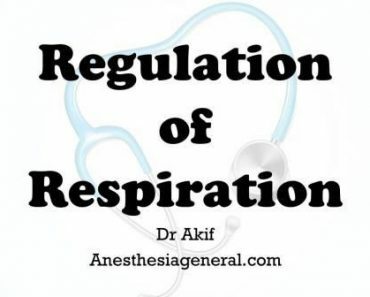 The bronchoconstricting effects of low inhaled concentrations of carbon dioxide were attenuated by inhaled but not by intravenous halothane, thus suggesting a direct action on airway musculature or local neural reflex arcs rather than centrally controlled reflex pathways. Halothane-, isoflurane-, sevoflurane-, and desflurane-induced dilatation of distal bronchial segments partially depends on the presence of bronchial epithelium.